The first project I wanted to work on after returning from vacation was Faith's Kalidescope Kite quilt. This one I'm actually keeping for myself! I've been hoarding my Katie Jump Rope fabric for a while, looking for the perfect pattern, and this one jumped out at me. I did my best to make do with the fabrics I had in the collection, but I added three of the new Denyse Schmidt Fairground/Picnic prints to fill in some color gaps. While these blocks came together really quickly, keeping them all in the correct position and orientation when putting the top together will be a challenge for me. 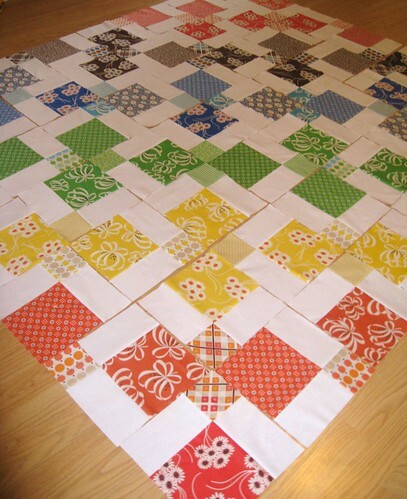 I'm notorious for mixing up my carefully designed order and this is a quilt where an error will be extremely obvious. Wish me luck! Thanks again Faith for creating such a cute, FREE pattern! This is going to be fantastic! I really want to try out this pattern too. P.S. I made two zippered pouches using your tutorial. So easy! Thanks for the helpful tips. I love it!!! And yeah, I was thinking I was going to make a mistake with the orientation of them when I was sewing them together too. I kept staring at it thinking "that's right, isn't it"? Haha Can't wait to see it done! I love this. I love it!!! Thanks Faith for making such an awesome pattern - this goes with the KJR just so perfectly. I am dying with the love! :] So glad you're keeping it for yourself! It's a terrific pattern, so nice of Faith to share it. I like how you shifted the colors, spreading the reds and oranges out. And it's interesting that it uses brown instead of purple -- I love purple, but this works great! This looks so fun! I always have a hard time keeping everything in the right position. Take a good photo and that is great reference when you sew it together. Love it! It's so bright & fun! :) Thans for sharing the link! Can't wait to make mine once I get unpacked!!! This is awesome! Now Im off to find that tutorial so I can make one to! Wow! This is gorgeous! I can't wait to see it finished! Wow, wow, wow!!!! 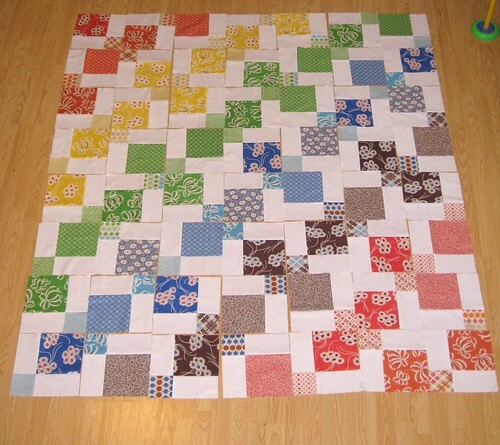 I love the Katie in this quilt!